We currently use cPanel / WHM on a reseller account but are looking at getting a dedicated server. My first thought was to duplicate this set up on the dedicated box to allow us to quickly create new accounts. I'll be a managed server so they'll have set up the LAMP stack. I'm curious if I actually need cPanel and WHM. We don't use many of the features from cPanel / WHM, just creating accounts and databases, clients do not have FTP access. I'm no sys admin and come from a Windows / GUI background but have some knowledge in setting up development servers. I presume this sets up the Apache virtual host, FTP access and DNS settings. I've some knowledge of editing the Apache files to create virtual hosts. Am I correct in thinking as long as the DNS is pointing to the server IP and the virtual host is configured the server can serve the (php) pages? I'm not sure I need per site FTP access as only we will have access so I could have a server wide/htdocs only access to view all the site. The company who supply the dedicated hosts would also provide the own DNS management tool so I'm not need to cPanel one. 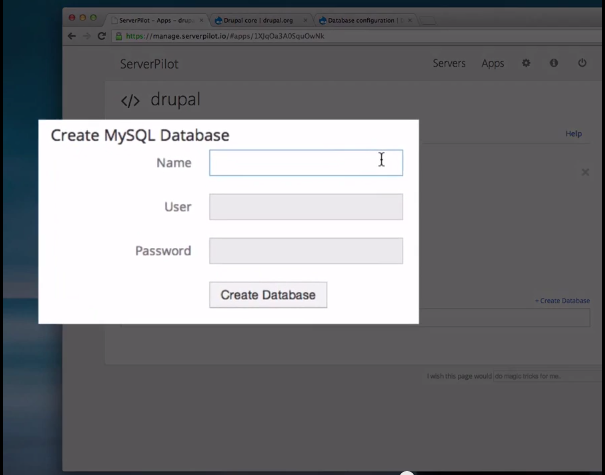 MySQL: Creating users and databases We use cPanel to create the MySQL users and databases. As it's a dedicated box and I can have root access I think this could be replaced by SQLyog for db management and phpMyAdmin for user management. Do you I need cPanel or can I get by editing a few text files for creating the accounts, then use the MySQL tools for databases? Or am I missing something major with how the sites are configured? creating MySQL databases and users. You can definitely set up your sites manually, but life may be easier (and consequently may be happier) by using a free cPanel alternative. ZPanel - A very impressive looking offering. I would be quite happy to short list ZPanel as it looks very polished. ServerPilot both the free and paid versions of this caught my attention as being a new approach to server control. I can see migration being very easy with Server Pilot. Direct Admin ticks all my boxes in terms of appearing to offer what is needed for even the most complex business solutions to selling hosting. It does not appear to offer integrated billing and payment out of the box but this should be fairly trivial (I imagine) to have the IT team set up for you. Froxlor - again this greatly impressed me and sold me on the idea of short lsiting it for my own use. The Webmin family of Free CPanel alternatives also deserve a mention. While the UI looks pretty darn dire compared to some of the modern systems it is still a solid and dependable Control Panel for whatever you need it to control. It might not be an elegant looking web hosting Control Panel but it is a comprehensive Server Control Panel with good support and the perfect price (nothing at all). Kloxo - a really solid looking offering that seems to offer more than the paid solutions. Another one for the short list. I work for ServerPilot and it sounds like you could get away with everything you need under our free plan. Installation only takes a couple minutes – we configure an optimized stack of Nginx, Apache, MySQL and up-to-date versions of PHP. This is pretty straightforward - simply create an app for each of your sites. For every app, you get modular vhost configs for Nginx and Apache, and each get an isolated directory root. Our vhost templates use sane defaults that should work for most users out of the box. When it comes time to add something specific to your vhost, customization is easy. This is fairly straightforward as well. We set up a default SFTP/SSH user just for your web apps and you can use this account to deploy updates to your apps. Additionally, you can create and manage new SFTP/SSH users. Effectively, this lets you have multiple apps on the same server that are managed by separate SFTP users. Each app can have MySQL databases associated with it and creating db users is effortless. Keep in mind that managing your own VPS or cloud server is much more involved than using a managed hosting. You most likely do not need cPanel if you are managing the server. I haven't used WHM, or Apache for that matter, but I know that most admins set their sites up through command line via SSH sessions. Any decent VPS/cloud hosting company will offer a DNS manager as part of the service - be sure to check. The entries you make at your domain's registrar will be based on the service provider you choose, usually it is two entries something like ds1.example.com and ds2.example.com. As far as your service provider's DNS manager, yes, typically you put in the IP address of the server they have given you. This should all be covered in their documentation. You should be able to use phpMyAdmin to manage all aspects of MySQL, so, in your case, both users and databases. Its ubiquity. If I need a cPanel server in a hurry, I can get one provisioned in about ten seconds -- literally -- at any of a bazillion hosting companies. That makes it really easy to migrate in a hurry if I need to. It also makes it easy for me to migrate new clients onto my service. They're probably on cPanel already, so it's just a couple of clicks to pull them over. My clients like it. The more recent interface themes are attractive and intuitive. But I never got any complaints about even the old, ugly ones. A cPanel license is cheap when divvied up amongst the clients on a server, so if they like it, they get it. cPanel also comes with some disadvantages, mainly consisting of the time spent figuring out how to modify settings and configurations in ways that cPanel won't overwrite the next time it updates itself. But that's a fairly infrequent thing. Personally, on machines that only I access, I don't bother with cPanel. For servers that clients access, I do. I think it's worth the cost for the convenience and to keep the clients happy. Not the answer you're looking for? Browse other questions tagged web-hosting apache cpanel dedicated-hosting or ask your own question. is it possible to do a cpanel to cpanel folder copy on the same server without downloading on home pc?